Dreaming of embroidery on something you’ve already got in your closet? Good news! I’m available for custom embroidery, on clothing and other ritual items. 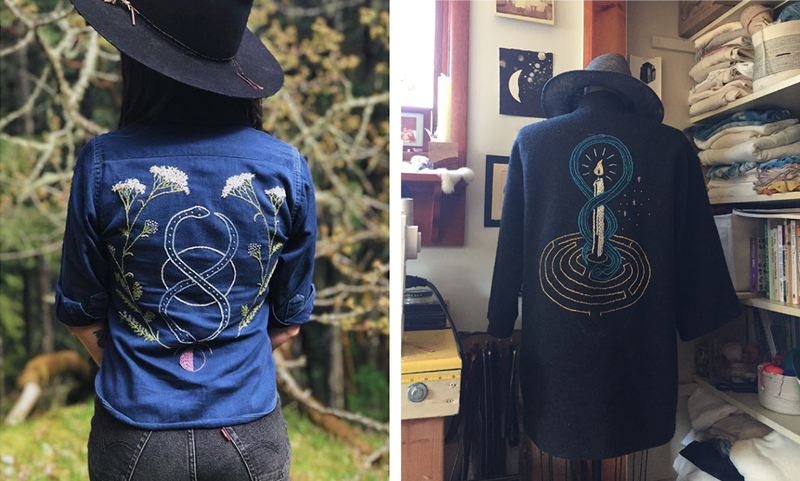 I love the collaborative process of designing dream garments in symbols and threads, and would be happy to discuss your new custom empowered adornment! Each custom order includes design consultation and color sketch preview. Click "contact" and fill out form, being sure to include a description of the textile you'd like embroidered, as well as what you'd desire embroidered. Listed below are my base prices, however, if you’ve got a budget to work within I’m happy to design within a pre-existing budget. …to your newly adorned ritual garment! Send me a message and lets get started on your custom order. Please understand it takes time to develop and stitch these designs by hand. Expect 2-3 weeks from when I receive the garment to when I ship the garment back to you. Sorry, but no refunds or exchanges are available on custom orders.